On this date in 1937 the Reichssicherheitshauptamt, Reich Security Main Office (known by its acro­nym RSHA), was created by Reichs­fuehrer-SS Hein­rich Himm­ler through the merger of the SS (Schutz­staffel) intel­li­gence se­rvice, the Sicher­heits­dienst (SD), or Secu­rity Ser­vice, and the Sicher­heits­poli­zei (SiPo), or Secu­rity Police. The SiPo com­prised the noto­rious Geheime Staats­polizei (Gestapo, or Secret State Police) and the Krimi­nal­polizei (Kripo, Crimi­nal Police). The first RSHA chief was SiPo head SS-Ober­gruppen­fuehrer (Gene­ral) Rein­hard Hey­drich. Hey­drich’s secu­rity ser­vice activ­ities in­cluded over­seeing for­eigners, moni­toring public opin­ion, and Nazi indoc­tri­na­tion. 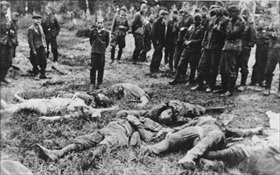 Its stated duty was to find and eli­mi­nate “enemies” of the Third Reich. “Enemies” included Jews, Com­mu­nists, Free­masons, paci­fists, and Christian acti­vists. The RSHA also over­saw the para­mili­tary Ein­satz­gruppen (“task forces”) death squads that followed the in­vading Ger­man armed forces (Wehr­macht) into East­ern Europe. It is esti­mated that between 1941 and 1945 these death squads and related aux­il­iary troops (even regu­lar Wehr­macht units acting on their own initi­a­tive) mur­dered more than 2 mil­lion people, in­cluding 1.3 mil­lion Jews, pri­marily in open-air shootings. Civil­ians were the main vic­tims. It was the nefa­rious Hey­drich who chaired the Janu­ary 1942 Wann­see Con­fer­ence out­side Berlin, which drew up plans for the elim­i­na­tion of Jewry in Nazi-occu­pied Europe. And it was Hey­drich’s RSHA that con­structed the con­cepts and oper­ated the admin­is­tra­tive appa­ratus that carried out the Holo­caust. In Lon­don, the British Special Opera­tions Exe­cu­tive (SOE) and the Czecho­slo­vak govern­ment-in-exile drew up a death warrant for Hey­drich, who was then Acting Reich Pro­tector of the Pro­tec­torate of Bohe­mia and Mora­via—the part of Czecho­slo­va­kia that was incor­po­rated into the Third Reich in March 1939. On May 27, 1942, Opera­tion Anthro­poid suc­ceeded in mor­tally wounding Hey­drich, known locally as the “Butcher of Prague.” Even­tu­ally the equally intim­i­dating, scar-faced, and vola­tile-tem­pered Dr. Ernst Kalten­brun­ner suc­ceeded to the office, and he headed the RSHA until his cap­ture by U.S. forces on May 12, 1945. Tried by the Allies at Nurem­berg, Kalten­brun­ner was con­victed of war crimes and crimes against humanity and executed by hanging on October 16, 1946. 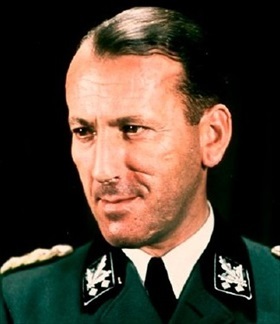 Left: One of the darkest figures within the Nazi pan­theon was SS-Ober­gruppen­fuehrer (Gene­ral) Rein­hard Hey­drich (1904–1942), head of the Reich Security Main Office (RSHA) from Septem­ber 1939 to his death. Hey­drich served as (of all things!) Presi­dent of Inter­pol (Inter­na­tional Crimi­nal Police Organ­i­za­tion) and chaired the Janu­ary 1942 Wann­see Con­fer­ence, which for­malized plans for the final solu­tion to the Jewish Ques­tion—the depor­ta­tion and exter­mi­nation of all Jews in Ger­man-occupied Europe. Right: Another President of Interpol was Dr. Ernst Kalten­brun­ner (1903–1946). He was an intimi­dating figure owing to his height, facial scars, and vola­tile tem­per. It was said that even Reichs­fuehrer-SS Hein­rich Himm­ler feared him. Kalten­brun­ner suc­ceeded the mur­dered Hey­drich as RSHA chief. 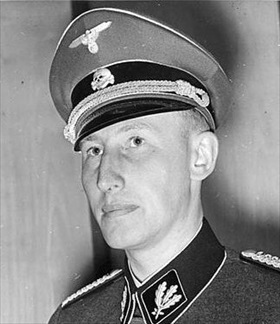 An Ober­gruppen­fuehrer (gene­ral) in the Schutz­staffel (SS) between Janu­ary 1943 and May 1945, Kalten­brun­ner was the highest-ranking mem­ber of the SS to face trial at the first Nurem­berg Trial (Novem­ber 1945 to Octo­ber 1946). He was found guilty of war crimes and crimes against humanity and executed. 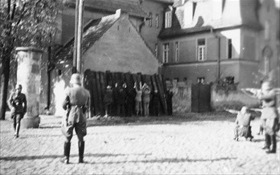 Left: Execution of Polish hostages (hard to see but facing wooden beams leaning against the house wall in the middle of the photo) by an Einsatz­gruppe (a SS mobile death squad) in Kór­nik, occu­pied west­ern Poland, on Octo­ber 20, 1939, a little over one-and-a-half months after the Ger­man inva­sion of Poland. The Kór­nik execu­tion was part of Opera­tion Tannen­berg, the code­name for one of the exter­mi­na­tion actions directed at the Polish people. A special unit dubbed Tannen­berg was created within the Reich Main Security Office. Con­scrip­tion lists pre­pared by Ger­mans before the war identi­fied more than 61,000 mem­bers of the Polish elite (acti­vists, intel­li­gent­sia, scho­lars, actors, poli­tical and mili­tary offi­cers, and others) who were to be in­terned or shot. Mem­bers of the Ger­man minor­ity living in Poland assisted in pre­paring the lists. Opera­tion Tanne­nberg ended in Octo­ber 1939 and was respon­sible for at least 20,000 deaths in 760 mass executions by Ein­satz­gruppen with some help from regu­lar Wehrmacht (armed forces) units. Right: This photo, a copy captioned by the United States Holo­caust Memo­rial Muse­um, was allegedly taken on July 5, 1941, in Slo­row, Ukraine. In it we see a “Jewish” teen­ager standing just left of cen­ter starring at the corpses of his “family.” On both sides are his pur­ported exe­cu­tioners. The photo is reversed and may have been pur­posely mis­iden­ti­fied. The fact remains that in the sum­mer of 1941, four units of Einsatz­gruppen, along with rein­force­ments, were sent to the Soviet Union and mur­dered approx­i­mately one million Soviet civil­ians in open-air shootings and in gas vans. The Babi Yar mas­sacre, which took place in a ravine of the same name in the Ukrai­nian capital of Kiev, killed 33,771 Jews in a single opera­tion on Sep­tem­ber 29–30, 1941.